Just about everyone on the face of the planet is aware of who Walt Disney is. After all, Disneyland and Mickey Mouse along with everything else relating to these world-famous theme parks have popped up in every corner of the earth. However, there was much more to Walt Disney than just Disneyland and Mickey. We will give you an overview of the man himself and some of his accomplishments during his lifetime. First of all, he was born as Walter Elias Disney in Chicago on December 5, 1901. When Walt was just 5 the family moved to Missouri. He showed an affinity for drawing early on. Later they headed to Kansas City. By that time Walt’s father Elias was too ill to tend to the farm they were previously living on. Together with his brother Roy, the young Walt helped their father out on his newspaper route. When he was 16, the family moved back to Chicago again, where the youngster attended high school. He became the cartoonist of the wallpaper there, which was his first painting job. The same year Walt dropped out of high school. He made a failed attempt at military service, being denied because he was too young. Instead, Walt joined the Red Cross where he spent a year. Upon returning he worked in Kansas City as a cartoonist but quickly became disillusioned with it. Subsequently, he headed out west to California, hooking up with brother Roy once again. With the assistance of an uncle who provided them a garage from which to work they formed Disney Brothers Studios. That garage became the first office of the company. In 1928 he created the character of Mickey Mouse. Now, it could be safe to say that the rest is history, but there is much more than that. His first cartoon with the adorable mouse was a silent one. However, Hollywood was quickly turning to talking films and Walt seized on the moment. Disney shrewdly acquired exclusive rights to use the revolutionary Technicolor for a period of two years. This was all he needed to be on his way to fame and fortune. 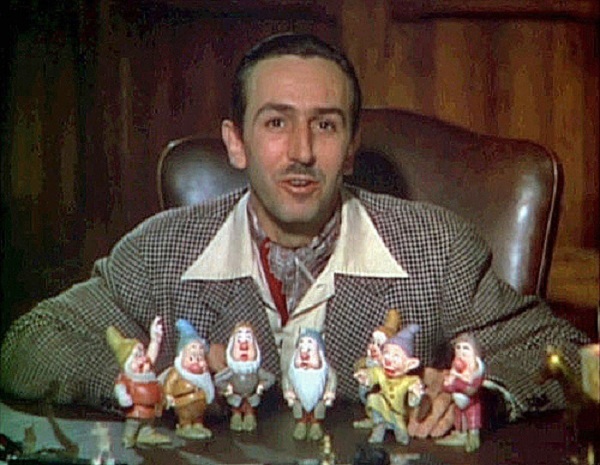 During the span of his career, Walt Disney would win an astonishing 26 Oscars. A record which without a doubt will never be broken. By then he had added Goofy, Donald Duck and a whole slew of other characters to his lineup. His full-length animated film Snow White and The Seven Dwarfs was the first to be made in Technicolor. Disney’s firm was one of the few to come out of the tumultuous 1930’s and 1940’s and thrive in the process. This was in large part due to the company cranking out propaganda, health and education films for the United States government. Not only that but the comedies they turned out also helped to boost morale nationwide at a time when the country really needed it. As with any business, there were small setbacks here and there, but for the most part, Disney’s company flourished, culminating with his development of the theme park known worldwide…Disneyland. Walt died before Disneyworld, Epcot Center and all the others came to fruition but by then he had laid all the groundwork necessary. Walt Disney was named by Time Magazine as one of the most important people of the 20th century and one can certainly say it was well-deserved. Today the Walt Disney Company is one of the biggest businesses not only in the USA but in the entire world. Its revenue for the year 2011 was more than 40 billion US dollars, which resulted in a net profit of 4.8 billion for this same year. The company is a leading diversified international family entertainment and media enterprise operating in five business segments: consumer products, studio entertainment, media networks, parks and resorts, and interactive media.